Every day I check Sue Wilson's blog for the new Creative Expressions dies and ideas. I love her cards even though they are huge, UK size cards and I try and use some of her ideas for the US size cards that I make. 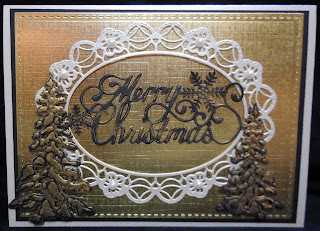 I started this card with a 5x7 soft champagne gold card (it's not really white) added a layer of black and then I added a layer of gold linen foil that I got from Michaels or one of the big box stores. I pierced it with my new rectangle piercing die from Cheery Lynn. I then added the Polynesian Sails oval doily in the soft gold and added some pearls. The trees are from Sue Wilson's winter trees at Joan's Garden website. You can click on Creative Expression, Sue Wilson and find tons of wonderful dies and card ideas with them. 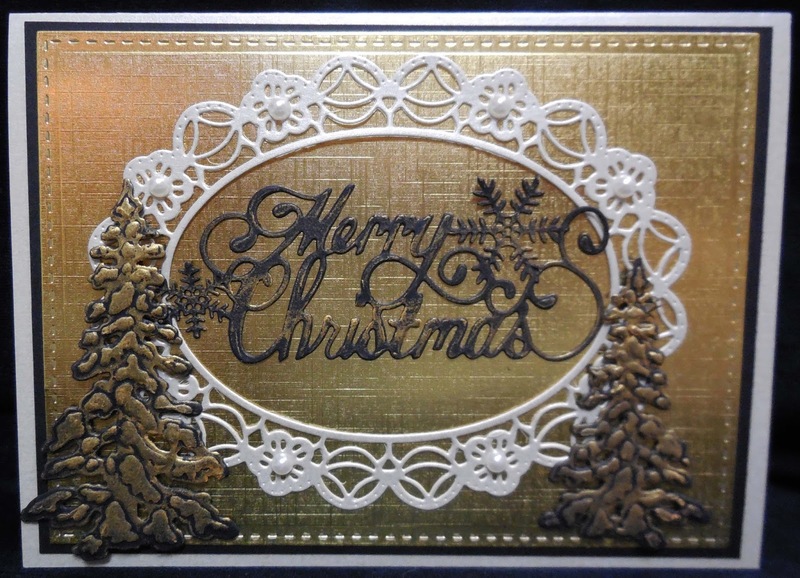 After watching the video on Sue's blog I cut and embossed the trees and the Merry Christmas in black and then added some soft gold gilding wax to them and to the Merry Christmas. This is definitely not a normal color combo for me but it's so striking in real life and I think I may do some more of this color combo. Thanks for stopping by and be sure to check out all the dies and ideas on Sue's blog. Wow, this is stunning, Karen. Love the rich look of the gold.